The Scottish Environment Protection Agency (SEPA) was established by theEnvironment Act of 1995, and is the official body responsible for the protection of the environment in Scotland. The organisation has the responsibility for local air, water and land pollution control, as set out by the Environment Act. To manage the many external enquiries about certain duties, SEPA has set up direct access to information for customers, e.g. its 24 hour Floodline, and Pollution Report line. Following the Freedom of Information Act (FOI) and the updated Environmental Information (Scotland) Regulations (EIR), the organisation is required to manage related queries within a twenty working day limit. To help meet the Act’s stringent requirements, SEPA has extended the use of Hornbill’s Supportworks which had been successfully used for a number of years by SEPA’s IT support team. The IT team supports all PCs, laptops, handheld devices, servers, network and telephone systems used by over 1200 employees across SEPA’s 22 offices. In addition, Supportworks is used by the Oracle development team to handle in-house development calls, as well by the geographic information systems (GIS) and web teams. SEPA initially implemented Supportworks for IT support but it is now being used by several desks: IT, Freedom of Information Act, Official Ministerial Enquiries, Floodwarnings, Call Centre (for environmental enquiries) and Sciences. Supportworks was already used by the IT department to manage IT support requests within SEPA. Based in Stirling, the central helpdesk has a centralised phone number and email address and coordinates and logs all IT support calls using Supportworks. The IT department has twelve support engineers located across Scotland who all access the helpdesk system. Supportworks call diaries enable staff to routinely document all calls, so that known issues can be highlighted and used in problem management and calls may be passed to second and third line support staff as appropriate. This saves support staff’s time searching for information and ensuring consistent logging and updating of calls and provides an efficient information service for customers with SLAs. The FOI team wanted to find a way to streamline processes so that they could manage incoming requests and meet the statutory deadlines imposed, without it becoming a burden on day-to-day operations. A pre-configured template built on the Supportworks platform was designed specifically to meet FOI legislation. The template is used to record enquiries, allocate them to the SEPA staff throughout the organisation to retrieve the information, track the request and ensure a response is given to the customer within the set FOI Act timescales. With workflow technologies built-in, Supportworks provides an audit trail of each request and provides tailored reports that monitor usage of the service. SEPA also adopted Supportworks in order to improve the management of customer queries within its communication centre. This team, located in SEPA’s Communication Centre (SCC), based in Perth, uses Supportworks on a daily basis to formally log and track external enquiries to the organisation. SEPA initially selected Hornbill’s Supportworks for its ease of use and its web-based functionality, enabling support staff located at different offices to access the system. 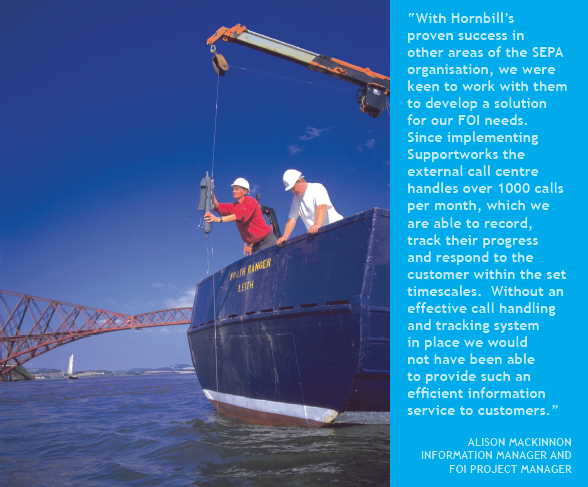 SEPA has been impressed with both the technology and the customer support provided by Hornbill throughout the implementation and development phases. The IT team at SEPA is currently working with Hornbill on an implementation of the Hornbill ITIL template to introduce ITIL best practice to its helpdesk. The IT Infrastructure Library (ITIL) is a process-based approach to IT service management that focuses on the effective integration of People, Process and Technology to deliver optimised service quality.